With a little time on my hands before my new semester starts, I am painting in a larger format and trying out some new (for me) paper stock. A few months ago I bought a sheet of Schut-Noblesse watercolour paper from Holland and thought I’d give it a try today. This scene in Lachine is one I sketched quickly in pencil on site this morning, took some reference shots and then painted a larger format (half sheet 15″ x 22″) in my studio in the afternoon. What a luxury it is to have a full day to paint! I’d love to hear from anyone who has tried this paper. The 140lb cold-pressed surface is quite nice to the touch, but is different than what I’m used to when you paint on it —it reacts almost like a hot-press paper. Even with a fully loaded brush, the washes get absorbed and dry quite quickly, so it’s almost impossible to go back into the puddle with more pigment, or even extend a wash into a new area because there’s almost always a dry edge somewhere. Technical but important details! I probably should have tried out a small sample of the paper before launching into a large painting, right? But once I realized what the paper was like I decided to stick with it and see what happened. I’m not unhappy with the result but I probably won’t buy another sheet, just because I know and love how my usual papers (Arches or Fabriano) react. But if you’ve tried this paper, send me a note and let me know what you think. But what a gorgeous result of trying something new! Yummy! Happy New Year! Thanks Anne. It’s an unusual paper but glad I tried it. Happy new year to you too. but it turned out so beautifully!!! I really like your painting a lot. The main difference to me is that there are more hard edges…I guess the paper doesn’t allow the paint to bloom. But, it is still lovely.Wish I could paint like that!. Thanks so much Pam. There are actually blooms in the painting, but it’s hard to get a rough edge because there’s not much texture to this. I did try it once again this week and still think the same thing — glad I tried it but won’t be trying it again. You mastered this paper very well. Nothing different from your usual that I could detect!?? Thanks Carolyn. I guess it looks the same as the rest of my paintings, but has a different feel when I paint on it. Definitely smoother than most cold press papers, and not much texture either. Beautiful view looking north of 24th ave. Again your shadows and electrical lines adds to the movement. Will we see ylou on McLauglin street?/\. Hi Andre. I actually did go to McLaughlin street first but they were cleaning the streets on Monday and it was hard to park. Where do you park there? I’d love to go back. 6th ave. to the stop at Sinelli, Then take chemin du musee. stop turn right on canal road and pass chemin La Salle. A little further is the netrance of McLaughlin street. Go in then as the street turns left you can park there looking north . thanks Andre. I will try again on a day when there is snow clearing going on! I’d say the end certainly justifies the means in this case – Wonderful results, and agree with Carolyn, I can’t detect any distracting hard edges. The brightness is exquisite. Just curious: did you soak and stretch beforehand? I haven’t heard of this brand of watercolor paper (but I’m not a savvy watercolorist). But, as they say in French: “Noblesse oblige” (LOL! just a play on words here). This paper is very bright white, which I like a lot. There are no hard edges but you can’t pause at all when painting a wash. I tried to be quicker than usual! I painted on this paper when it was dry. I just taped all four edges and it dried very flat so I guess there is not much sizing on it. Now that I look at it, I may give it another try. Love the crispness of this painting! You can get some good sharp edges on this paper Karen, because of the smoothness of it. Makes the whites stand out really well. You did a great job with it. The colors are very clear and bright, and I see no evident hard edges. Toy made the paper proud, regardless! I read Charles Reid uses it sometimes. It’s on my list to try. That’s funny Julana. As I was painting, it sometimes felt like there were areas that looked like little bits of a Charles Reid painting as they dried. Like the stop sign on the left and the shadow under it. I wasn’t sure why but maybe he uses a smoother paper too. I always love your street scenes, particularly when they’re mixed with snow. I’m just starting to think of watercolors as something more than wet crayons so I’m very low on the learning curve. I was surprised, and yet not surprised by your comment that hot press absorbs more quickly than cold press. That seems counter-intuitive to me but it’s certainly what I’ve seen and just thought it was me. 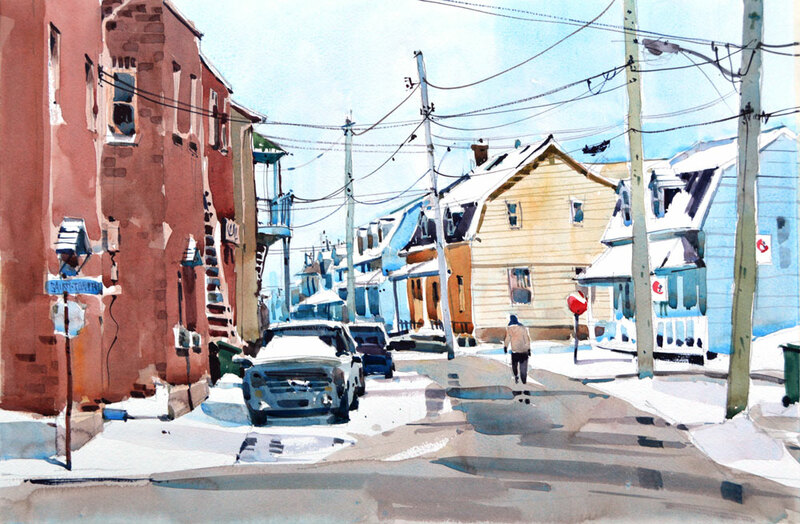 I love painting winter street scenes in Montreal, and this is certainly a good week for it. I bet you have a lot of snow this week in Quebec City too. I heard that our storm from last night came your way. Hot press paper is definitely harder to paint on, especially when you have a big wash. A sky is near impossible for me, unless I wet the paper in advance. But this paper seems to be somewhere in the middle between hot and cold press, and maybe there is less sizing on it which would increase the absorbency. More research needed, I think. You showed the sunlight so well in this!!! Despite the paper not working as well as you wanted you got a great result. I love the reflections in the puddles. A small detail, but one that really makes everything pop. Have you tried the Fabriano soft press paper? The texture supposedly lies somewhere between cold press and hot press. The smaller the picture the less I love rough textures, and I have a couple sheets coming to test. Hi Tom. Thanks for writing. I have tried the Fabriano soft press many, many times. I love it. It’s great when you don’t want too much texture, and you express it well when you say that the smaller the picture, the less textured you like the paper. I never thought about it like that, but it’s so true. This paper is perfect for still life, flowers, small street scenes that I do. I’d love to hear what you think once you have tried it out. As always with Fabriano, it is a great paper.